Tierney is at her most visceral in this brightly-colored film noir. With her green eyes pulsing in a fury of emotion, she makes you feel the simmering frustration of her dangerously possessive character. Tierney is meant to be a villainess, but she so effectively communicates how tortured she is by her destructive impulses that she manages to elicit some sympathy. In this epic, but strangely intimate drama, Tierney plays a less twisted, but similarly destructive beauty. She has a rigid view of the way her life and the world around her should function and does not hesitate to destroy anyone who stands in her way. For that reason, she should be totally repellant, but while it is almost as if she could cut you with those sharp, high cheekbones, her fanatical belief in her methods gives her so much vibrancy that kinder souls tend to fade into the background when she is present. In one of her most complex performances, Tierney plays a farm girl who takes up residence with her distant cousin in a stately, but spooky estate. She takes her character through a remarkable transformation, from a giddy, romantic child to a jaded, disillusioned woman, while demonstrating that she still clings to the spiritual values instilled in her by her ferociously religious father. Though impressed by her opulent surroundings, she keeps her farm sensibility, and Tierney is at her level-headed best when she shoots down any hint of pretension or false values. 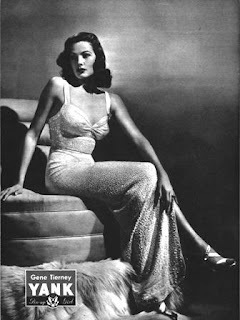 KC, I'm a huge fan of Gene Tierney. I think my favorite film of hers is. LEAVE HER TO HEAVEN (1946). Awesome!! performance. After writing this post, I decided that Tierney's peformance in Leave Her To Heaven is one of my favorites of all time--let alone her best perfomance. The complexity of emotion she communicates is simply stunning.